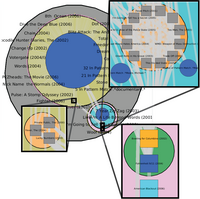 A Visualization tool to support literature review. 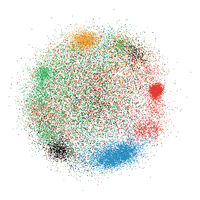 A visualization system designed for sequence analysis of eye tracking data. 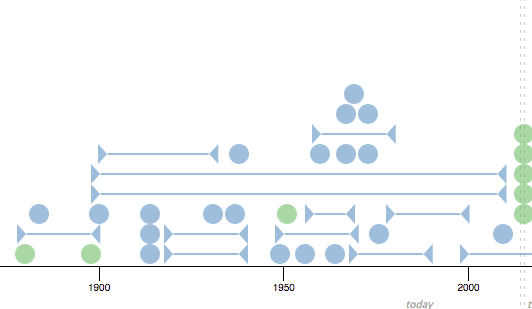 Browser-based vis tool for curating timelines generated from freeform text. A R/Shiny sandbox environment for creating visualization sketches relating to the energy use of a portfolio of buildings. All-Pairs Query, or APQ, nearest-neighbor algorithm and the Q-SNE, dimensionality reduction algorithm. Browser-based vis tool for investigating large text document collections. Vis tool for analyzing genetic sequence variants. Visual tool for fisheries management data analysis. Exploration tool that supports the comparison of multiple gene expression data sets defined both spatially and temporally. Tool that visualizes temporal gene expression data over multiple molecular pathways and across multiple species. Visual tool for dimensional analysis and reduction. 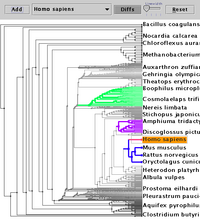 Browser that enables analysis of comparative genomics data through visualization across multiple scales. 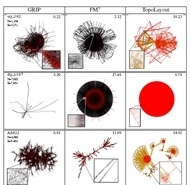 GPU and CPU versions of fast and robust multilevel multidimensional scaling algorithm. Multilevel graph hierarchy exploration tools, built on the Tulip framework. Quasi-tree graph layout, built on the Tulip framework. Feature-based multilevel graph layout, built on the Tulip framework. Cytoscape plugin for compartmentalized network layout, for instance using subcellular localization annotations, and comparing quantitative data from multiple experiments. TJ is open-source software for browsing and comparing trees. It uses accordion drawing, an information visualization technique that features rubber-sheet navigation and the guaranteed visibility of marked areas. It was specifically designed for biologists who want to compare phylogenetic or taxonomic trees, but can work for any hierarchies. It can handle trees of up to several million nodes. SJ is open-source software for browsing and comparing gene sequences, using accordion drawing. HypViewer is the 3D hyperbolic module used in Site Manager below, now available for free noncommercial use. Contact SGI for licensing for commercial use. Site Manager was free software from Silicon Graphics for webmasters and content creators. It included a 3D hyperbolic view of the link structure of the target web site. That module was an implementation of the layout described in Tamara's InfoVis 97 paper. Version 1.1 includes the guaranteed frame rate drawing algorithm described in a Graph Drawing 98 paper. Tamara was one of the core team responsible for design, implementation, documentation, distribution, and maintenance of Geomview, a public domain 3D interactive visualization package with over one thousand registered users. They encourage people to let them know how they use their tools, and have heard back from hundreds of them in a wide variety of domains, including topology, computational geometry, computer graphics, robotics, medical imaging, nuclear physics, mechanical engineering, civil engineering, biomechanics, spacecraft design, computational electromagnetics, and seismology. The Triangle Tiling museum exhibit allows people to explore the connections between symmetry groups, tiling, the Platonic and Archimedean solids, and non-Euclidean geometry through interactive 3D graphics. Tamara adapted research software originally written by Charlie Gunn for museum use with Stuart Levy and Olaf Holt. The program features mathematical concepts such as the relationship between Platonic and Archimedean solids, duality, and spherical geometry. The adaptation was done in collaboration with the Science Museum of Minnesota, where it is on exhibit. The software was also shown at "The Edge", the interactive installation showcase at SIGGRAPH 94. There's an article about it in the Geometry Forum archives. The CAIDA toolset for network drawing. Some aspects of it are described in a paper on visualizing the MBone. These tools were used to create a series of short videos, including the Planet Multicast video. The toolkit can also be used to create Web pages like the MBone or the NLANR caching hierarchy daily pages, which contain automatically generated 3D and 2D snapshots of the day's data. Tamara was involved in the VRML 1.0 standards process starting in 1994, when integrating 3D with the Web was a hot new topic. The WebOOGL software was a proof of concept to back our format proposal. After SGI Inventor-based proposal won the vote (ours came in second), we retro-fitted the WebOOGL software into a quasi-compliant VRML 1.0 viewer. Development has not continued since Tamara left the Geometry Center in 1995, and it is rather unlikely that any 2.0 support would ever be added. Tamara's mathematical zoo page has seen a lot of traffic since it was part of the original content pages highlighted during the first big VRML browser release in March 1995. It contains files in both VRML and the WebOOGL native 3D format.